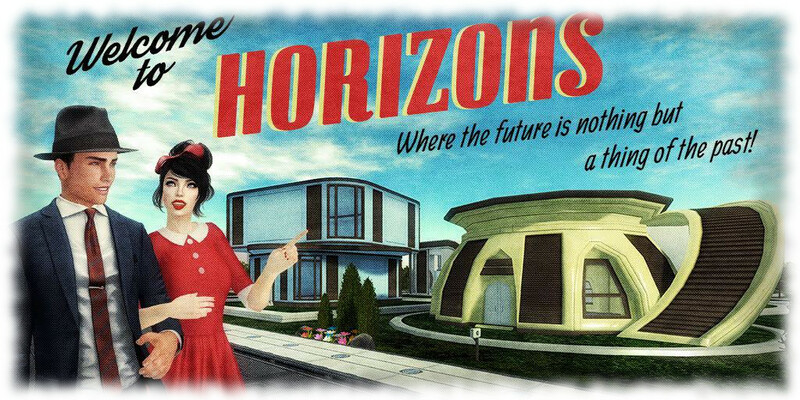 On Tuesday, November 15th, Linden Lab announced a new Mainland community initiative called Horizons. It’s been the subject of much speculation and debate since two blocks of 60 regions associated with it appeared on the main grid map for testing purposes in October. Patch Linden further stirred up interest by posting some teaser images to his Profile feed! Picking up on the SL13B hints, I contacted the Lab with the idea of covering Horizons – not only what it is, but also how and why it came about. Patch and his team were very receptive to the idea, and as result, I had the opportunity to tour the regions ahead of the opening, and learn more about it from Naughty Mole of the Linden Department of Public Works (LDPW). In short, Horizons presents a new 36 region Mainland community residential environment open to Premium members. Associated with this are four identical info hubs and two community regions, together with twelve regions of open water. All of this has been built around a new, six region experience-based adventure / quest called the Horizons Experience, which is open to all residents. As I’ve covered the gaming experience in Inside the Horizons Experience in Second Life, this article focuses solely on the residential aspect of Horizons, and the supporting info hubs and community regions. As noted above, the residential regions are available for Premium members. Designed with a “retro futuristic” look (think The Jetsons and you’ll be getting close), with integrated road system and waterways, each of these regions offers a number of 1024 sq metre parcels which, with the increased land capacity for Mainland, coupled with a x2 object bonus, have a total Land Impact capacity of 702 each. But that’s not all. Associated with each parcel is a “mailbox” control centre allowing parcel holders to select one of six different house designs which are provided “free” for their use: they do not count towards the parcel land impact allowance. The houses can be held individually or by a group, and can be used for residential or business purposes. In addition, the “mailbox” offers a resource pack containing textures and bits to allow the houses and parcels to be dressed, while each house design includes a built-in control panel for lighting, window shades security, etc. 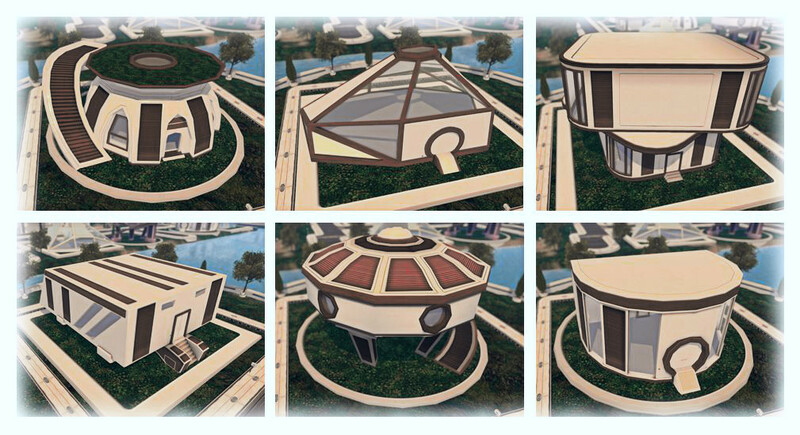 For those who don’t wish to use the six supplied house designs, there is an option in the mailbox to clear the parcel. Land holders can then put down their own choice of home / structure instead – although this will count towards the total LI capacity for the parcel. It is hoped that those who opt to go this route will select a design in keeping with the overall “retro futuristic” theme of the regions. A couple of further points to note is that the Horizons regions are all Adult rated and are connected to the north side of the Zindra Adult mainland continent. I’ll get to why in a moment, but suffice it to say for now, this shouldn’t be taken to mean the environment is for purely adult activities. The second point is that terraforming, including parcel subdivision, is not allowed on any of the regions. It is through the four identical info hubs visitors coming to Horizons via the Destination Guide will gain their first introduction to the regions. “Each one has a landing point,” Naughty explained as we teleported into one. “Spread out around that, are the rezzing zones for boats and flying vehicles and the land information area, where people can find out about obtaining a parcel on Horizons. This has an introductory video and a link to the Horizons wiki page which has everything you could possibly need to know. The two community regions comprise three social areas open for use by residents: a bar – the H(orizons) Bar, a more chilled-out lounge, and a meeting facility. “These are spaces where you can socialise,” Naughty explained as we toured the regions. “You can have a formal meeting, an informal meeting, or go hang out in the bar, where we have music and dance balls, so will hopefully be a place for people to hang out, meet friends and so on.” As well as the social spaces, the community regions also include their own rezzing zones for water and aerial vehicles.